Last Wednesday was a great evening for RSI! We held our first-ever “friendraising” event and presented our first-ever RSI Appreciation Award. Our generous friends at the Chicago office of the Skadden Arps law firm kindly hosted a beautiful reception for about 60 people. This was our first reception designed to introduce RSI to new friends in the Chicago corporate and legal world. Attendees included lawyers from some of Chicago’s largest corporations and law firms, judges from the counties where RSI conducts foreclosure mediation programs, and RSI’s own Board and staff members, with a sprinkling of local neutrals, funders and others. The two highlights of the program were remarks by the Illinois Attorney General and the presentation of the RSI Appreciation Award. 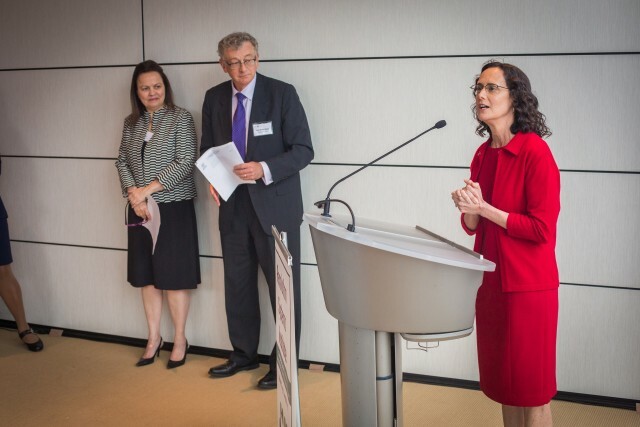 After a warm introduction by RSI Board President Judge Morton Denlow, Attorney General Madigan spoke about the ways her office has addressed the foreclosure crisis on behalf of homeowners in the state and about her support of foreclosure mediation through a grant to RSI. It was great to hear someone who entrusted RSI with more than a million dollars praise our work! I had the privilege of presenting the first RSI Appreciation Award to the pro bono team at Skadden Arps. The RSI Appreciation Award recognizes those who have provided an exceptional service to our organization, enabling RSI to accomplish our mission of strengthening justice by enhancing court ADR. 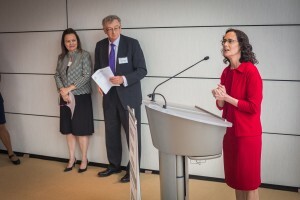 Skadden lawyer Rene Ghadimi and his team – Lance Phillips, Sarah Ralph and Christine Szafranski – were the perfect first recipients of this award. They transformed RSI into a free-standing, incorporated, federally-recognized non-profit organization. I also recognized The Law Project, which was the match-maker for this beautiful relationship, and Eddie Houlihan, who handles pro bono for Skadden. Wednesday was a wonderful evening of new friends and celebration. On with RSI’s court ADR work! This entry was posted on Monday, June 2nd, 2014 at 4:54 pm	and is filed under Foreclosure Mediation, People & Events, Uncategorized. You can follow any responses to this entry through the RSS 2.0 feed. You can leave a response, or trackback from your own site. Best wishes on RSI’s maiden journey!